The term fruit wine has come to describe wine made from fruit other than grapes, like cherries, peaches, strawberries and plums. Usually marketed as a dessert wine, different fermentation processes can actually produce sweeter, or dessert, wines to very dry wines, reaching the point where all sugar is consumed by the yeast. For California Fruit Wines, the goal is to find the “sweet spot” for each type of fruit in an effort to “fine tune where on the dry-sweet spectrum each of these fruit belongs,” they said. In addition to Cranberry and Apple, the company’s current holiday lineup includes Pumpkin Spice, Apricot, Plum and Chocolate Cherry. The wine makers said many customers encounter similar obstacles when navigating fruit wines as they do with traditional wines. 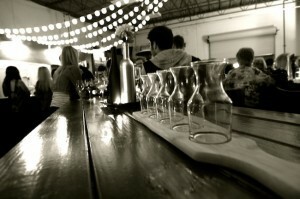 “When you think about the traditional wine industry, there are a bunch of barriers to entry for a first-time customer. Not only is the customer confronted with a vast array of choices, but they aren’t given the tools to navigate through those choices,” Brian Haghighi said. The brothers operate a 4,500-square-foot tasting room in Vista, Calif., where they celebrated their grand re-opening on Nov. 17. They had over 250 guests, and the opening was a big success. The grand opening also served as a Thanksgiving food drive, with the company partnering with California State University, San Marcos marketing students. The brothers are currently waiting for a Vista City Council decision to grant them a cabaret license, which would allow them to provide live music at the winery and tasting room. “We’re the entrepreneurs created by the recession,” Brian Haghighi said. “Although we didn’t have money to invest, we did have time. So we’ve had to be resourceful.” Part of that resourcefulness included “bargain” shopping, they said, including purchasing second-hand equipment, which can be expensive if bought new. 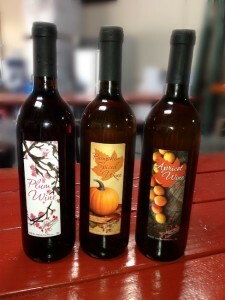 California Fruit Wine Company is located at 1040 La Mirada Court, in Vista, Calif. Regular tasting hours are Thursdays and Fridays from 4 – 8 p.m., and Saturdays and Sundays from 12 – 5 p.m. For more information contact them at californiafruitwine.com or by calling 858-522-9463.